Contrary to media reports that the at-large suspect believed to be the "handler" of the two suicide bombers, brothers Brahim and Khalid el-Bakraoui, responsible for 11 deaths at Brussels Airport on Tuesday was captured, Belgian police officials say they do not have custody of but are "closing in" on the third suspect, Najim Laachraoui. Moroccan-born, Brussels-raised Laachraoui, 24, is believed to have acquired his bomb-making knowledge during a February 2013 trip to Syria, according to the Washington Post. Laachraoui is a known acquaintance to Salah Abdeslam, the sole surviving perpetrator of the ISIS-sponsored attacks in Paris in November 2015, which amassed a death toll of 130. Abdeslam, who was arrested after a months-long manhunt last Friday, was reportedly supposed to take part in Tuesday's attacks. Laachraoui and Abdeslam were stopped together in a car at a police checkpoint at the border of Hungary and Austria in September, only weeks before the Paris attacks. Najim Laachraoui's brother, Mourad, is a successful Taekwondo athlete who represents Belgium on a global circuit. 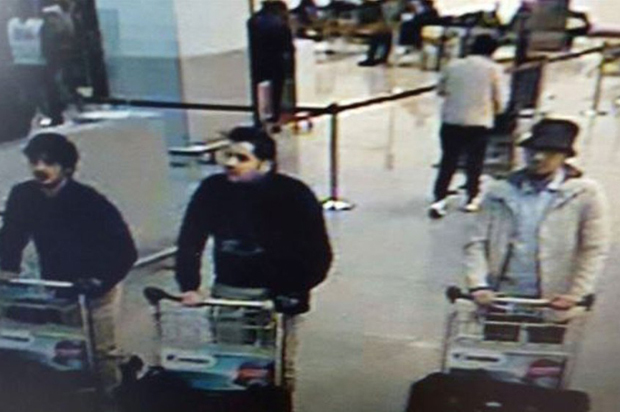 Their father told reporters that he recognized his son, the so-called "man in white," in the widely circulated image (below) from security camera footage of the suspects at the Brussels Airport prior to the explosions, but that his family "have not heard from him for three years." As of this writing, Laachraoui remains at-large amid a widespread police manhunt. Raffaello Pantucci, the director of international security at London's Royal United Services Institute think tank, told NBC News that, though there's a possibility Laachraoui is hiding in Brussels, as Abdeslam had, he's more likely heading towards Iraq or Syria "where he would be safe." "Bomb-makers are quite rare," Pantucci explained. "So if that was the case he would be valuable and [ISIS] would try and keep him alive."